Can social media improve customer service for businesses? Growth of your business depends on how well your customer service is. It’s really important that you give good customer service. The fact is, people are using social media for customer service. The most common reasons why people use social media for customer service. With the current consumer uptake of technology, the demand for online customer service will grow rapidly. Businesses’ be ready. Here are some ways you can improve customer service on social media. offer Skype or live chat option with a person for sales, service, consultations, account enquiries, etc. Businesses need to throw out the old model of ringing for customer service. Why? The old system needs to be reinvented to meet and exceed the people’s expectations. Businesses can no longer funnel people through a channel. 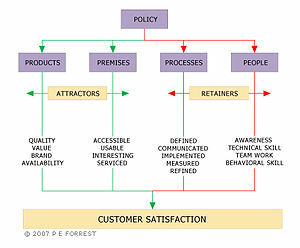 You need a hybrid model of a funnel system and social media touch points (include mobile devices) for customer service. You need to rebuild your customer service strategy to include all the ways people can interact with your business. Include Sales, PR, Customer Service or Marketing to design a better customer service model. Does PR, marketing or customer service members respond to online customer service? What other ideas can improve customer service on social media? ‹ Where is Google Search going? Sorry mate, I don’t use Twitter at this stage, but will in the future. I’m glad you enjoy the blog and I hope it gives you some ideas. Cheers. to your webpage? My blog site is in the very same area of interest as yours and my users would truly benefit from a lot of the information you provide here. Go ahead and quote some of the articles, thanks also for including credits and sources back to the website. Your blog site looks cool and I’m glad that you know people who could use this information. Thanks for sharing it. I know they’ll appreciate it as well. My website has a lot of exclusive content I’ve either authored myself or outsourced but it seems a lot of it is popping it up all over the internet without my authorization. Do you know any ways to help reduce content from being ripped off? I’d certainly appreciate it. Unfortunately, written content issues with plagiarism and copyright breaches is common on the net. Unfortunately I don’t know any way of reducing content being ripped off. I thought I read somewhere about a software that can track articles on the web, but I can’t remember the name. You may be able to google it. I know people use my content without my authorization but they usually give me credit for my site and article. I placed this in my conditions and I’m happy with this arrangement. If you find a solution, let us know. Cheers. Hello. splendid job. I did not expect this. This is a fantastic story. Thanks!… You made certain fine points there. I did a search on the subject matter and discovered the majority of folks will have the same opinion with your blog…. I’m glad you like the story, and thanks for your compliment. I’m glad I was able to surprise you and I’m glad you did some searches on the subject matter. Hope this gives you some ideas and please share.